In 1953, Watson and Crick’s discovery of the double helix structure of DNA revolutionized science. This revelation was made possible by a unique visual problem solving approach. The application of the new visual approach, although rudimentary at the time, created successful physical modules to help narrow down the structural possibilities, which eventually created an accurate picture of the molecule. Knowing the impact of visual communication in improving our understanding of medical and scientific concepts has driven me to be part of this creative profession. I strive to help facilitate similar problem solving for medical professionals and simplify the complexity through visual storytelling. In fact, many clients have noted how easy it has become to communicate their ideas and complex data utilizing medical art. This is because there is a science behind what I do; the science of biomedical visualization. Biomedical Visualization is a science of communicating ideas and information by transforming them into forms that can be visualized. Biomedical visualization specialists, commonly known as medical illustrators, are professional artists with advanced expertise in medical sciences and the creative methods for visual communication. They are visual story tellers who communicate complex scientific concepts by breaking them down into simple and easily comprehensible visual material. They also facilitate visual problem solving for medical and scientific professionals. Their creative process includes heavy background research, collaborating with scientific experts, and other methods to ensure accurate portrayal of the concepts they convey. This allows their work to be integral in promoting medical education and scientific research. If you have a medical concept to communicate, a research idea to explain, or a medical device to showcase and promote, I can provide that. I create medical illustrations and animations that are both accurate and visually appealing. Check our my gallery to see more of what I do. I help professionals in various medical and scientific fields present their ideas and products with clarity and ease.  I specialize in both the medical science and visual communication to solve visual problems and transform complex information into easily comprehensible visual stories. My work includes medical text book illustrations, medical journal and magazine illustrations, pharmaceutical illustrations, surgical illustrations, and presentation design. I create storyboards and animations which can be used a short educational films for a variety of applications. 3D modeling can offer the realism of traditional photograpy with far greater efficiency and flexibility. Medical animations can be effective in communicating different concepts that can be too challenging to understand through traditional media, such as visualizing microscopic processes that occur in the human body or to teaching medical students how to learn basic surgical techniques. Preparation for USMLE has become more challenging due to its extensive content outline, unique question formats and the various preparation materials that can lead to increasing confusion. If you are in need of focused guidance and tutoring for USMLE Step1, 2CK or 2CS, I can provide comprehensive online sessions that help you improve your ability to apply the knowledge necessary to pass each step. I can also design a unique lifestyle coaching program to help you succeed at this challenging journey! REALIZE THAT EVERYTHING CONNECTS TO EVERYTHING ELSE."